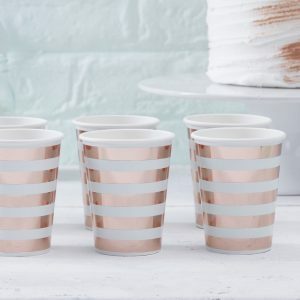 Mint and rose gold 3 ply paper napkins. 20 napkins in each pack. 33cm. These elegant paper napkins will make a beautiful addition to your baby shower. Gorgeous mint paper with sophisticated rose gold script that reads, “Hello World”. What a wonderful way to celebrate the coming of a new baby! Don’t bother with those plain napkins that have zero percent pizazz! Jazz up your napkin situation by using ones as adorable as these! Hand out these glamorous party napkins at your baby shower. They are a luxurious 3 ply tissue that really add that extra special finish! Each pack contains 20 napkins that are 33cm. Check out these “Hello World” advice cards! The perfect accompaniment!